Photo of Pacific chorus frog © Michael Benard: Natural History of the Pacific tree frog - Pseudacris regilla (used by permission). 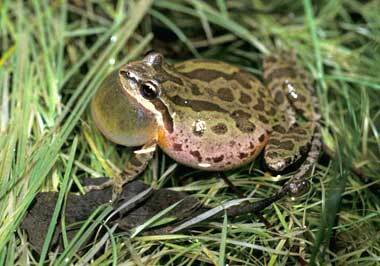 The Pacific chorus frog (also called Pacific tree frog) can be brown, tan, grey or green, and produce their charming sound by puffing up their throat sacs to three times the size of their heads. They are beneficial by eating insects, including mosquitoes. 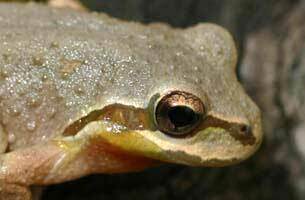 Watch and listen to a video of a Pacific chorus frog from Michael Benard's website - Natural History of the Pacific tree frog.